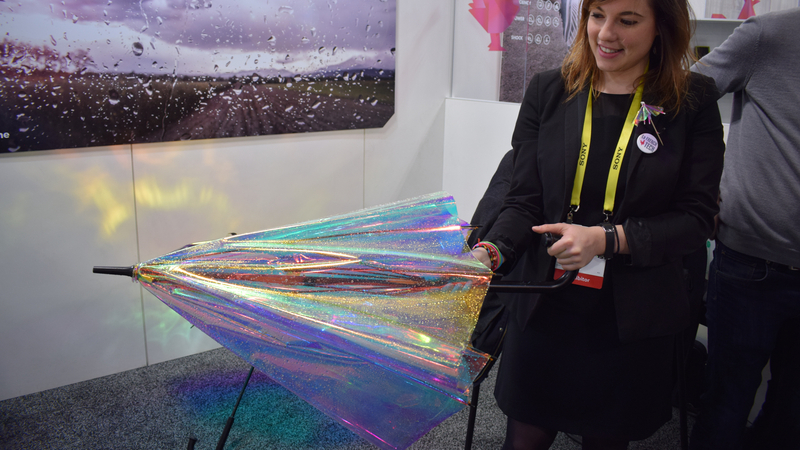 At this year's CES we saw a connected hairbrush and a connected walking cane, but more fool you if you leave the house without your connected umbrella. Courtesy of French startup Wezzoo, the Oombrella works with an app to alert you when a downpour is imminent. Wezzoo's weather app lets users share real-time weather information, which is then crowdsourced and analysed (along with other sources) to alert Oombrellas that it's about to rain in their area. Notifications are sent to your phone, so if you're about to leave the house without your brolly and a downpour is on the way, Oombrella will send you a reminder to go back and grab it. There are also humidity sensors built into the umbrella's handle so information can be shared back to the app to alert others that something is brewing above. At Wareable we're often guilty of leaving the house without an umbrella - no matter how many we seem to buy - so we can definitely see the benefits Oombrella could offer. Wezzoo has run campaigns on both Kickstarter and Indiegogo, and says it will be shipping the umbrella from March. For non-backers, it's going to retail for $79. There'll be three versions - black, white, and shiny - all of which have a UV-resistant canopy. Speaking of crowdsourcing tech, Plume Labs was also at CES showing off its air pollution tracker, Flow, which draws data from users to map out the cleaner - and more hazardous - areas of your city.